If you’re the sort of person who likes to feel at one with nature then you might think that hotels are not really your thing. But this selection is treehouse hotels from around the world might just succeed in winning you over. Nestled in the trees of the Gandoca-Manzanillo wildlife refuge, and just metres from the pristine Punta Uva beach with its emerald blue waters, the Treehouse Lodge in Costa Rica will make you feel like you’re in heaven. It has everything you need including beds for up to six people, a private bathroom, and kitchen and a shower built in and around a 100 year old Sangrillo tree. There is just one treehouse in the resort and it costs around 400 US dollars per night for four people. Ever wondered how birds feel living high up in the treetops? Well now you can experience it for yourself at the Cedar Creek Treehouse B&B. Located in the wilderness close to the Mount Rainier National Park, the cottage is located 50 feet up a 200-year-old western red cedar tree. And now to make the experience even more spectacular, you can climb up a suspended “stairway to heaven” to reach an observatory room 100 feet up in an adjacent fir tree. Located on Hainan Island in the South China Sea is a resort of four treehouses. Like something from a fantasy epic, the treehouses are built in the tops of tamarind trees, interlinked with rope bridges to create a world above the forest floor. The tree house units look out onto a quiet, endless, pristine beach and are located close to a 5000 acre Buddhist and ecological park containing temples, pagodas and beautiful Oriental gardens. If you fancy something a bit more adventurous then the Vythiri Resort in India might be just what you’re looking for. Located deep in the rainforest at an altitude of around 4000 feet, the tree houses are as authentic as you could wish – constructed from logs bound together with twine, and with thatched roofs and open windows. Rope bridges connect platforms in the trees, and one of the treehouses is accessed by a lift made of cane and powered by a water counterweight. Don’t be mistaken though, you won’t be roughing it at the Vythiri Resort, with comfortable rooms and beds, stunning views, and of course, service to attend to your every need. If you want the tree house experience but don’t want to get quite so close to nature then the Canopy Resort near Cairns is the perfect luxury experience. Set in 100 acres of protected rainforest, you’ll be surrounded by ancient trees and wildlife such as platypus, parrots, tree kangaroos and rare green possums, but unlike open air treehouse hotels, you won’t be worried about any of these creatures sharing your king-size bed. Ever stayed in a treehouse hotel? Tell us where you stayed and how you found the experience. Was it exciting, refreshing, scary, inspiring? Share your experiences in the comments below. Cedar Creek Treehouse definitely has a cool thing going with their treehouse. 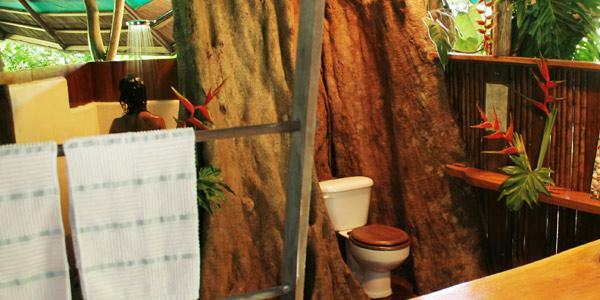 Even if you can’t stay there the night we often recommend their treehouse tours. I would love to live in something like this, its like everyone’s childhood dream isn’t it? Wow Jeff, that Ewok Tree House in your blog post is truly amazing. Fantastic design – thanks for letting us know about it! Hi Kane. Great to hear from someone from the local area. You’ve got yourselves a beautiful part of the world over there!